We are eco-friendly cooperative hostel. We are doing our best to make sure sanitary products and detergents are biodegradable, not animal tested and not produces by large corporations, and stationery we use comes from recycling. Our hostel is a peaceful, family-like place for people who want to work, read or simply spend their time in a narrow circle. In particular we invite activists from informal groups or collectives, workers and volunteers of non-governmental organizations. The elderly and people who organize festivals will find special offers tailor-made for them. 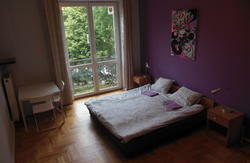 Emma Hostel is a new inititive in Warsaw. It is located in a four-storey tenement house of historical value, in 25 Wilcza street, within a walking distance from Centrum tube station (10-minute walk) and Central Railway Station (15-minute walk). Close to all major transportation routes, with easy acces to any part of Warsaw. - 24h reception. Arrive at any time! - Tourist info. A lot of hints for active tours! Wilcza Street is located in the city centere. Closest tram/bus stop is on Marszalkowska Street (major street of Warsaw), and it's called 'Plac Konstytucji'. By foot (10-15 min): walk along the Al. Jerozlimskie street in the Praga direction this means you wil have the Palace of Science ans Culture on your left side. Walk up to the next big crossing, with Marszałkowska street. Turn right, so that you pass the big Novotel Hotel on your left. Walk stright ahead, up to Wilcza street, and turn left. Hostel is on your right. By public transport (10 min): go to tramstop at Aleje Jerozolimskie (Jerozolimskie Alleys) and get any tram in the Praga direction. Get of at Centrum bus stop the first stop. Then, go to Marszałkowska Str., and hop on any tram in Mokotw direction. Take of at first bus stop, which is called Hoża Str. Go straight ahead, and turn left into next street. This is going to be Wilcza street. Go ahead, and stop at number 25. Get a bus 175, take off at Centrum bus stop. Follow the walking directions from paragraph above.